There’s no other piece of kit that’s loved or hated as fiercely as a pair of mud encrusted boots. If they fit well and are good for the job at hand, they’re almost out of mind. But if they don’t – boy, do your feet let you know about. Not surprisingly they fill the pages of most forums and “ask the gear guy” columns. Here are some thoughts on boots I’ve loved as well as exerts from and links to reviews and buyers guides. Description: A fabric covered boot with a Gore-tex liner and Vibram sole. Strong points: comfortable out of the box, light and waterproof. Weak points: Don’t last as long as pure leather uppers and the waterproof liner also cuts its longevity. The newest versions of the boot now use eVent fabric, which some will say beats Goretex in breathability. When I talk about these boots I have to gush. They’re a British epic made by a legend of a company that has since gone bust and been rescued. The boots have lasted me about 5 years, taken me to three continents and walked on everything from desert to glaciers and deep snow at almost 6000 meters. Their first great point is that they’re relatively light (about 700 grams a boot) and very comfortable, right out of the box. I bought them in a hurry just days before a weekend’s hiking in the hills when I discovered a great big hole in my previous pair (Hi-Tec something or other – and the last of their boots I ever bought). The fitted like a glove, didn’t need real breaking in and cased barely a blister in my first few days of hard hiking. They give great ankle support, don’t compress the Achilles tendon and breath pretty well for what they are – which is a weird hybrid of fabric and a gore liner. The waterproof liner, when it works, works great. You can wade through streams, stomp in mud, and walk along a wet, grassy path all day without and water getting in. Like all breathable lined boots, a very sweaty foot will pump out more water than the liner can get rid off quickly, so a pair of wicking socks is essential to keep you feet nice and dry. Damp feet in hot weather is probably the most common complaint you’ll hear about them. The down side, is that the liner does have a limited life. Once that gives up, there’s no way you can keep your feet dry. Unlike a leather boot, the fabric on these will soak out and let water through. Waterproof coatings like Nikwax help slow it wetting out but it won’t keep the water out in seriously damp conditions. The other weak point to these boots is that the fabric is less durable than top quality leather. Mine were badly scuffed and showing their age on the uppers after a long trip to Nepal. That said, they still held up pretty well. The Vibram sole gives good grip and wears well too. These boots don’t take full crampons and aren’t stiff enough for a day of kicking steps in snow (I’ve done it and would prefer a far stiffer boot for that next time). 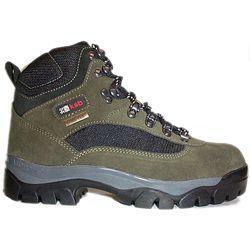 All in all, they’re great boots for light hiking all the way through serious trekking and multi-day backpacking with a heavy load. I wouldn’t recommend them for extended walking in cold conditions on snow and ice. For that I’d look to boots in the class of Scarpa Manta or La Sportiva Makalu which have heavier leather uppers and stiffer soles to accept a crampon. This is what some other reviewers had to say about these hiking boots. A great boot at the price and well worth putting on your wish list. At this price and specification Karrimor have aimed the Solitude GTX right at the hillwalker who wants a great performing boot at a budget price. Vasque Zephyr Hiking Boot (70 to 100 pounds)If you are looking to do more serious winter climbing though and need to wear crampons you may want to look at a genuine winter boot, which this really isn’t. I’ve written reviews on the La Sportiva Makalu and Scarpa Manta that you can read on this blog. If you are interested in serious high altitude climbing you may also want to read the article I’ve written on Scarpa’s Omega boots. If you’ve owned or tested any of these boots please let me know and I’ll put your views up here. *These prices were correct as of August 2005 from the Web site of a major U.K. retailer. Shopping on the Web or in the U.S. may yield lower prices. I just bought another pair of Karrimor KSB 399 boots after my previous ones had worn out. I found them on special at Amazon for £45 pounds and fired off an order right away. One change is that the liner is now made from Event fabric rather than Gore-tex. I’ll keep you updated on whether they are as great as my old Karrimor boots were. All in all, they're great boots for light hiking all the way through serious trekking and multi-day backpacking with a heavy load. I wouldn't recommend them for extended walking in cold conditions on snow and ice.